Karen Mahmud, 43, of Long Island, N.Y., holds her long-haired Chihuahua, Lola, who barks in a squeaky whisper after surgeons cut the dog's vocal cords. When Porter, a 123-pound black Newfoundland, attempts to bark, it comes out as a raspy cough. 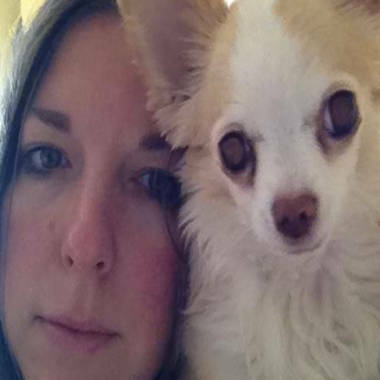 When Lola, a 6-pound long-haired Chihuahua, tries, she emits only a whispery squeak. Both dogs have been “devocalized," or surgically muffled, using a controversial procedure regarded as either barbaric mutilation by lazy pet owners -- or as the last resort of animal lovers desperate to keep their furry companions. Porter’s owner, Sue Perry, a 58-year-old Connecticut bookkeeper, and Lola’s owner, Karen Mahmud, a 43-year-old New York nutrition blogger, fall squarely into the first camp. They’re part of the Coalition to Protect and Rescue Pets, an activist group that helped get the practice known as “debarking” or "devoicing" outlawed in Massachusetts two years ago. Now they have set their sights on the American Veterinary Medical Association. Though they’ve never met in person, the two women have joined to launch an online petition demanding that the AVMA, the nation’s leading group of veterinarians, condemn devocalization when the organization reviews its policy on the procedure later this year. So far, more than 125,000 people have signed onto their cause. But that point of view is vigorously opposed by groups such as the National Animal Interest Alliance, an animal welfare organization in Portland, Ore., and by dog experts such as Charlotte McGowan, a Boston-area dog breeder and noted American Kennel Club honoree who has judged at the Westminster Kennel Club Dog Show. To advocates, the procedure is a rarely performed, simple operation that can allow an owner to quiet incessant barking that may lead to eviction, friction with neighbors or stress so intense it makes them want to get rid of the pet -- or worse. “It’s giving a tool to someone who really loves their animal and is at the end of their rope,” said McGowan, who refers to the procedure as “bark softening” and says it doesn’t totally eliminate a dog’s ability to make noise. McGowan, 68, said she has had dogs debarked herself during more than 40 years of breeding and believes the procedure is both safe and effective, with no lasting damage to the animals. Though there are behavioral interventions and techniques to stop problem barking, some dogs are resistant to training, McGowan said. “You hate to take a dog out of a home where it’s loved just because it barks," she said. On the surface, the new petition, posted by Change.org, is aimed at influencing the AVMA’s policy on debarking. The group currently opposes the practice in general, but says devocalization may be used when other efforts have failed as a “final alternative” to relinquishing or euthanizing an animal. Perry and Mahmud believe the AVMA’s reach is so broad, representing more than 82,500 veterinarians in the U.S., that the group should take the lead in opposing devocalization in the U.S. In Europe, they note, debarking is illegal. 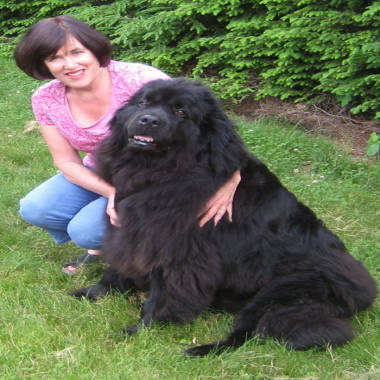 Sue Perry, 58, of Hartford, Conn., relaxes with Porter, her 7 1/2-year-old Newfoundland dog. He was debarked by previous owners and has had to have surgery to remove scar tissue in his throat. Still, he has trouble with breathing and eating. “Until the AVMA changes their position, they’re condoning it, saying it’s OK as a last resort,” Perry said. But Sheilah Robertson, a veterinarian and assistant director of the AVMA’s Animal Welfare Division, notes that the AVMA may have influence, but it has no ability to set laws or enforce bans. “We just make strong recommendations,” Robertson said. Other animal groups in the U.S., such as the American Society for the Prevention of Cruelty to Animals, or ASPCA, do oppose the practice outright. That group “does not support the use of surgical procedures that attempt to circumvent the behavior issue while exposing pets to unnecessary discomfort and risk,” the agency said in a statement. At issue is the procedure known as venticulocordectomy, which involves removal of an animal’s vocal cords either by going through the mouth or through an incision in the throat, according to the AVMA. It’s used to quiet dogs -- and cats, some say -- who are too loud or incessantly noisy. Experts say dogs bark excessively for many reasons: poor training, boredom, social isolation, in response to external stimulation, to protect territory and because of anxiety or compulsive disorder. Though debarking is regarded as a simple, fairly inexpensive procedure -- about $400 to $500 -- critics say it deprives animals of their natural ability to communicate and poses physical problems from scar tissue that can impair breathing, eating and other normal activities. Many veterinarians refuse to perform the procedure and Robertson said it’s no longer taught in veterinary schools. That’s because although there are other surgical procedures performed in that area, devocalization is never a medically necessary procedure, said Joel Woolfson, a board-certified veterinary surgeon in private practice in Medway, Mass. Rather, Woolfson added, the procedure is performed by pet owners seeking a "quick fix" who don't want to spend the time and energy to address the actual cause of the problem. "It's the ones that are just too lazy to try other approaches," he said. "Or they are just insensitive to the fact that it's a procedure that can cause some suffering." No one knows for certain how many devocalization surgeries are performed in the U.S. each year. It may be less than one-tenth of all dogs seen for office visits, according to background material for Ohio legislation aimed at banning debarking of vicious dogs. Four states -- Massachusetts, New Jersey, Pennsylvania and Ohio -- have laws banning debarking under certain circumstances. In Massachusetts, the law passed in 2010 was championed by the Coalition to Protect and Rescue Pets, the volunteer group that includes Perry and Mahmud. In McGowan’s view, such groups are often made up of activists who hold extreme views and rely on scare tactics to advance their goals. McGowan notes that many of the same people are ardent supporters of spaying and neutering pets, both invasive surgical procedures that could be viewed as being performed because they benefit humans. Robertson, of the AVMA, said the group’s Animal Welfare Committee will consider many points of view, from scientific evidence to public opinion, when members review the debarking policy. Until then, although the heated discussion will continue, people who actually want to find a surgeon to debark a dog might have trouble, Robertson said.